My husband shared something with me that he read on Facebook a couple nights ago that has been rolling around in my head the past couple days. I’m paraphrasing (and frankly to lazy to look up the exact saying) but it was something like this…. Low self esteem happens when we compare our behind the scenes with someone else’s highlight reel. 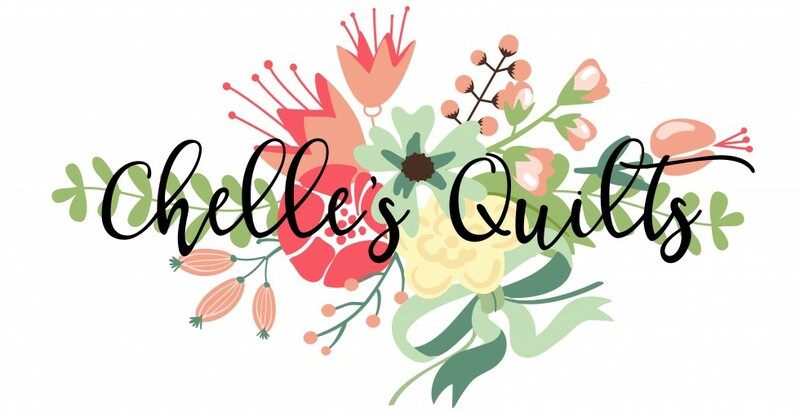 Sometimes I catch myself envying other bloggers and how much they get done, how perfect and pretty their creations look and how successful they seem to be in selling patterns, designing fabric or getting books published. All dreams I’d love to accomplish someday, but this world is all still new to me and I’m lucky if I can get more than one blog post done in a week, let alone finish very many projects while running 4 kids all over the place and trying to keep a semi clean home. So rather than trying to show you my highlight reel for this week, I’ll let you peek behind the scenes at my messy work space. This is is where I sew. I don’t have a “studio” or a room to call my own. 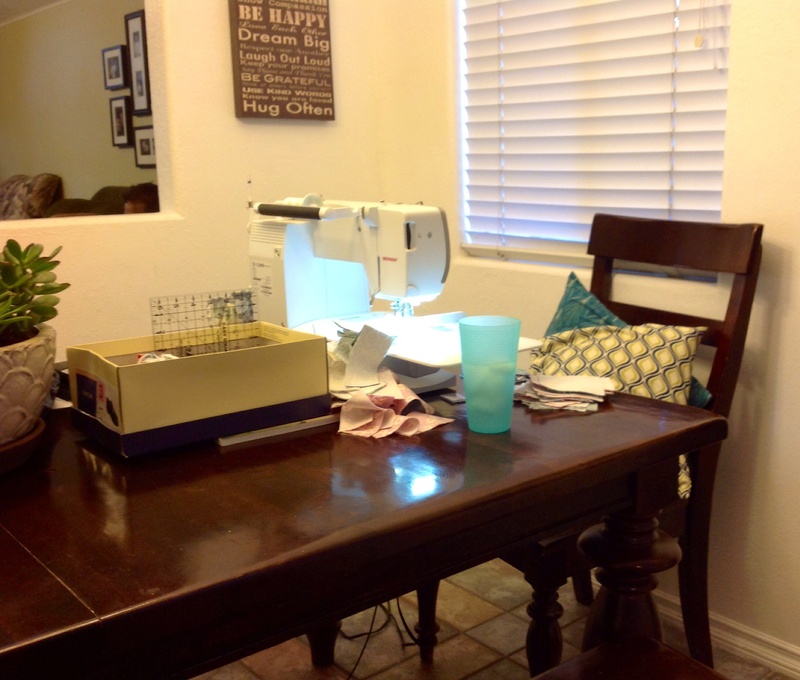 I sew at the end of my dining table in my cramped kitchen. The mess around my sewing machine is rather tame at the moment. Some days my stuff is spread all over the entire table. It’s been over 100 degrees for most of this week so I haven’t been sewing much (I just can’t concentrate in this kind of heat). This overview shows the mess a little more, but trust me this is pretty tame! There are times when creativity strikes and I just can’t be bothered with straightening up the aftermath of my fabric cuttings or a half finished project as I get inspiration for the next. 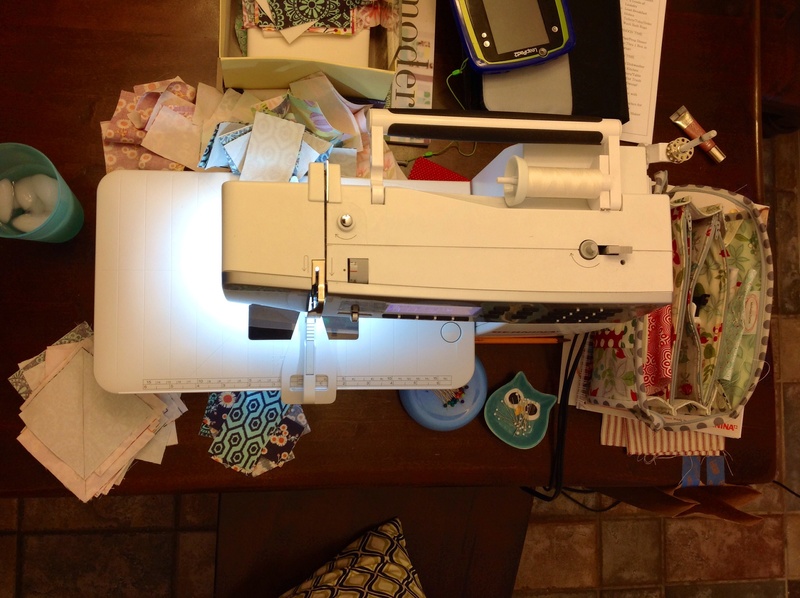 My machine stays on the kitchen table most of the time, unless we have a get together, then it’s put away till it’s over. But it’s never long before I pull it back out. For dinners, we slide my stuff down and we all fit. Since I don’t have a studio to line the walls with shelving to display my beautiful fabric, I have it crammed in various places. I’ve seen a lot of great armories on Pinterest that were converted to craft cabinets, so I’ve recently done the same. I took this picture after a little spring cleaning last week. It doesn’t usually look this clean. Here is what it usually looks like. 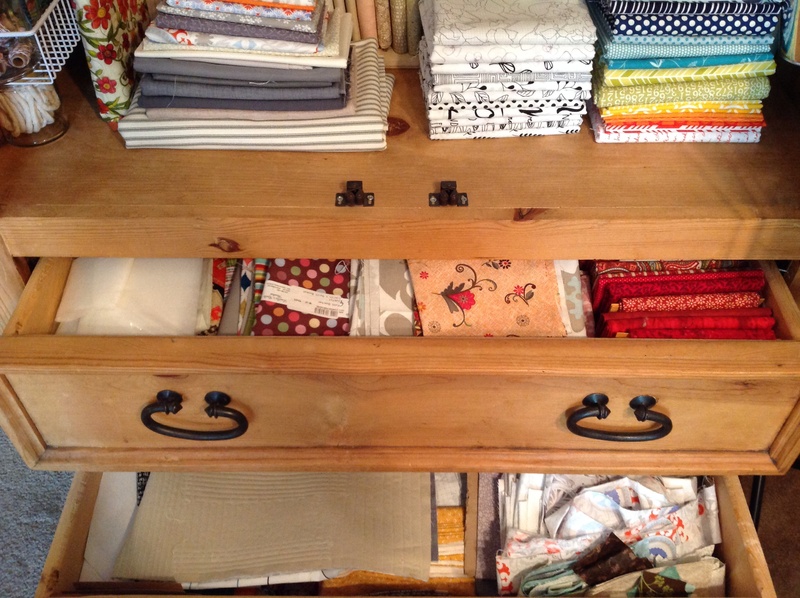 Those drawers beneath are always a mess. I didn’t even clean those during my spring cleaning session. Just piles of fat quarters, scraps, patterns ripped from magazines (I used to keep all my magazines but they’ve been taking up way too much room so had to make space somehow). See the little corner on the right of red fat quarters? That’s as far as I got organizing the drawers about a year ago. I start organizing and folding fabric, then inspiration hits and I have to start cutting and making something. This boring cleaning can wait! The rest of my fabric is in my bedroom closet. I’m not a fashion girl, don’t have a lot of shoes and my basic jeans and tee wardrobe doesn’t take up much space. In fact I share a closet with my three year old and both our wardrobes fit just fine. 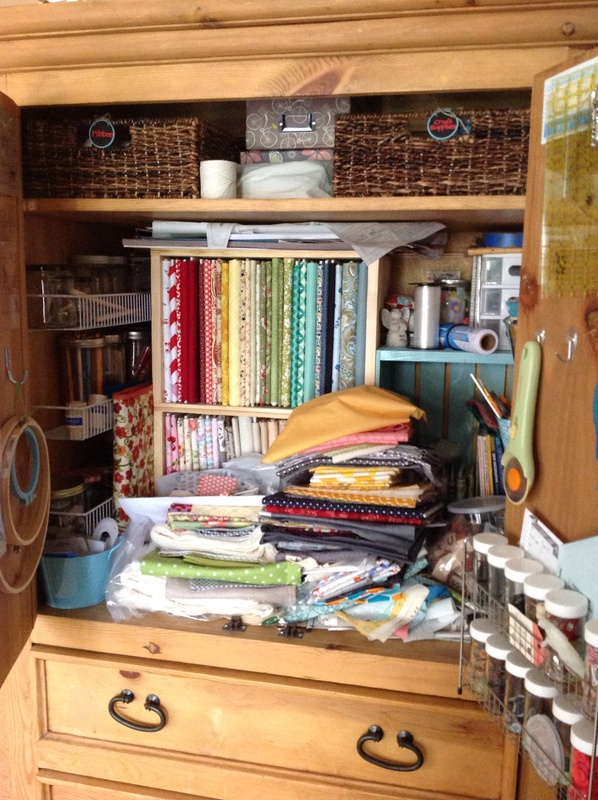 At the top of my closet I have plastic bins where I have tried to start organizing scraps. If I have leftover cut squares from a project I’ll try to organize them by size. I have a giant plastic bin of scraps I’d like to one day go through and cut into useful sizes. I’m hoping this inspires me to make things with my scraps. If they’re cut and ready to use I think I will. I also have a few plastic bins in the garage with batting and fabrics that I don’t use much at the moment. 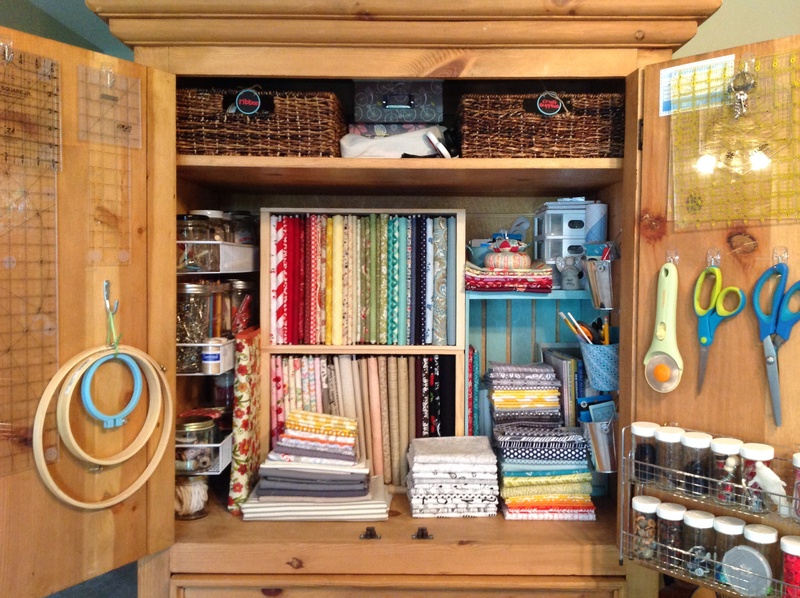 So there you have it, a peek behind the curtain at my creative space and storage. I hope that one day I’ll have a separate room all my own where I can make my messes and feel less in the way. Until then I make due with what I have. Next week promises to be cooler and hopefully I’ll get some more sewing done. That’s looking pretty great. Thanks for sharing–it’s fun to see behind the scenes sometimes!! I like when others show behind the scenes too!